(21171.41, Minneapolis Public Library Collection, OHS). BASSETT, MABEL LUELLA BOURNE (1876–1953). 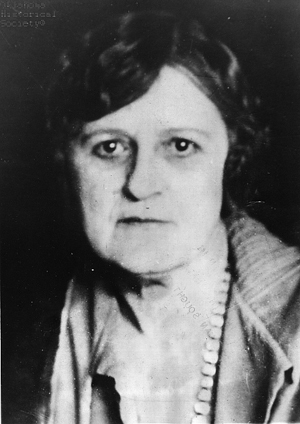 Mabel Bourne Bassett served as Oklahoma's third commissioner of charities and corrections for six consecutive terms (1923–47). Born in Chicago, Illinois, on August 16, 1876, Mabel was the only child of Stephen Bourne, merchant and Civil War veteran, and Martha Ellen Bourne, suffragist and one of the first women in the country to edit a newspaper. Mabel graduated from the Missouri School of Social Economy in St. Louis and married Joseph Bassett, a railroad conductor. The couple had three children. In 1902 the Bassetts moved to Sapulpa, Indian Territory, and by 1910 Mabel had organized one of the state's first humane organizations, the Creek County Humane Society. Commissioner Bassett worked to promote fair living conditions and opportunities for the state's inmates. Notable advances included bills requesting a new building for woman prisoners at McAlester and the removal of delinquent African American boys from the penitentiary to a more suitable home in Boley. She ran on the Democratic ticket for Congress in 1932 but was defeated by a Moore schoolteacher named Will Rogers. After losing the office of commissioner to Buck Cook, she retired. When Mabel Bassett died in 1953, acting Gov. James E. Berry ordered that her body lie in state at the State Capitol Blue Room so the public could mourn her passing. Jessie Randolph Moore and Elsie D. Hand, "Tribute to Mrs. Mabel Bassett," The Chronicles of Oklahoma 32 (Winter 1953–54). Joseph B. Thoburn and Muriel H. Wright, Oklahoma: A History of the State and Its People, Vol. 4 (New York: Lewis Historical Publishing Co., 1929). Tulsa (Oklahoma) Tribune, 2 August 1977. Tulsa (Oklahoma) World, 3 August 1953. Tobie A. Cunningham, "Bassett, Mabel Luella Bourne," The Encyclopedia of Oklahoma History and Culture, https://www.okhistory.org/publications/enc/entry.php?entry=BA035.